One approach is to quote statistics about how church visitors use websites. 50% of church guests under the age of 40 will check out your church’s reputation with their friends on social media. 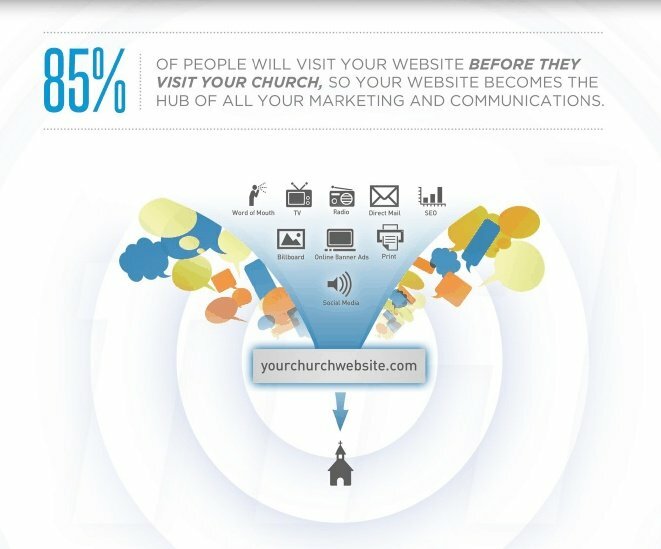 75% of first-time guests have already formed an impression of your church based on your website. Your “greeters” are no longer your first contact with your guests. According to one poll, 80% of people who visit your church visit your website first. But I can’t find the data sources behind these statistics, so take them as background information. It’s now considered a fact that a potential visitor to your church will check out your church website before they visit your church. I’ve found all sorts of unsourced claims that show that fact. So while the percentages may vary, the point is likely very true. So, if you are the pastor of a church who needs to persuade your leaders to invest in a good church website, what can you do to make your case? You connect how they use the internet to a find answers to your need for a church website. When you have gathered your decision team together, do this exercise. Find out about a big event that is coming to your town and pick detail you want your team to find (like how to register, time of the event). Identify a church fellowship in your town that doesn’t have a website, or a church of an unfamiliar denomination. The nearest Starbucks and give you directions on how to get there, plus their operating hours. The Sunday worship time of the nearest church fellowship of an unfamiliar denomination. Details on how to attend a big conference coming to town. . . . (you’ll need to pick one ahead of time). Add your own interesting questions that have a level of detail (like phone number, address, operating hours). How many churches of your denomination are in your area. I bet most of them will pull out a smartphone and try to answer. Give a cookie or something to the one who finds the answer the fastest. Who breaks out a smart phone and starts searching for answers. How many smart phones get pulled out to find those instant answers. Frustration when you can’t find simple information like an address, phone number, or operating hours. Connect how they used the internet to answer their questions to the same things that potential church visitors do to learn about your church via a website. If someone wants to know what time our service is, what would they find? If someone wants to attend a denominational church in our town, what would they find? If someone wants to know what church in town has Christmas Eve services, what would they find? Discuss the words that your leaders or elders type into a search engine. How many of them use your church name instead of “Presbyterian church, name of town”? Don’t assume a visitor knows your church name. Discuss the results that come up when you type in your church name. How can I listen to or watch the last few sermons? I’m sure you can think of additional questions about how a church website should answer the questions in the minds of potential visitors. I think personal frustration of not being able to answer those questions by asking Google will give the a-ha that you want in your leaders, more than statistics. Do you have any personal stories of searching for church websites when you are visiting family? Share a story either about ease of getting the information, or frustration at not finding it. I subscribe to a email list of church administrators and this one has been highly recommended in that list. I don’t use Clover personally, because I know how to handle my website, but my friend Rich uses Clover for his church as he describes some of the investments he made in his church (Tip #1 in that article).